The details were reported Thursday morning on Chinese news site 21cbh.com, and summarized by analyst Brian White of Topeka Capital Markets. According to the report, Foxconn originally expected to begin receiving LCD TV panels for an Apple television in the fourth quarter of this year, but that scheduled arrival from Sharp has apparently been moved up. The publication allegedly spoke with a Sharp executive and other sources at the company, which led the news outlet to believe LCD TV panels have been ordered for an anticipated Apple television. The report suggested such a device could be made available before the 2012 holiday season. "In our view, a holiday launch would make for a very merry holiday season for Apple and consumers," White said. "However, we will continue to monitor the data points surrounding the timing of this launch as they could change." Foxconn bought a 10 percent stake in Sharp in March, worth $808 million, in an effort to help boost Sharp's struggling LCD business. The deal prompted speculation that both companies were hoping to enter into Apple's supply chain for the company's anticipated television set. Some have suggested that Sharp's new Indium Gallium Zinc Oxide (IGZO) panels would be a good match for an Apple television. Sharp is already a major display supplier for Apple, including Retina displays for the new iPad. 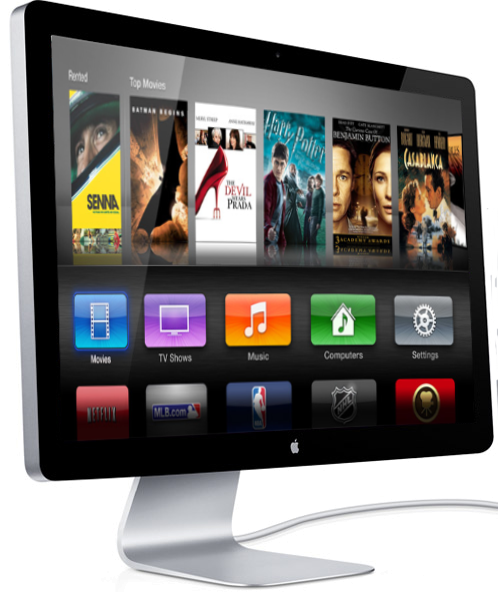 White believes the pieces are in place for Apple to launch a full-fledged HDTV in the near future. With just a 2 percent unit share in the LCD TV market, White believes Apple could generate sales of $10 billion per year, with $1.50 to $2.00 in earnings per share. Earlier this month, White revealed that while visiting Taipei, Taiwan, for the Computex trade show, sources in Apple's supply chain hinted that the anticipated Apple television will have a "special type of motion detection technology" that will be the primary method of controlling the device. He was also told that the television could include a "unique" plastic-backed remote control with a touch panel, appearing similar to the iPad, for control of the device.